Salmond: Leaders 'misled' voters Jump to media player Alex Salmond, says he is "surprised by the speed" at which Westminster party leaders are "reneging" on their promise to devolve more power to Scotland. 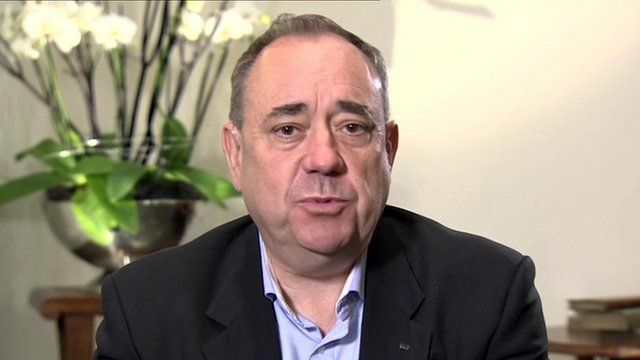 Alex Salmond: I'm not going away Jump to media player The first minister of Scotland says he is not going away and plans to remain part of the Scottish political process. Brown vows to see pledges delivered Jump to media player Former Labour Prime Minister Gordon Brown has pledged he will do everything he can to deliver the extra powers that have been promised for Scotland. No devolution 'quick fix' - Miliband Jump to media player The Labour leader Ed Miliband has said there can be no "quick fix" programme of devolution in England, Wales and Northern Ireland. Police separate rival crowds in Glasgow Jump to media player Protestors are demonstrating in Glasgow as supporters of the Yes and No campaigns gather in the city centre. Voters' views as Salmond resigns Jump to media player Alex Salmond is to step down as first minister of Scotland and as leader of the Scottish National Party (SNP) after voters rejected independence in Thursday's referendum. Joanna Gosling hears from people in Aberdeen. What could Act Two hold? In 60 secs Jump to media player The stage is still set for change after the independence vote, not just in the Scotland, but the rest of the UK. Scotland: What tipped the balance? Jump to media player The BBC's Allan Little analyses what reasons motivated people to vote for or against Scottish independence. Scotland's First Minister Alex Salmond says he is "surprised by the speed" at which Westminster party leaders are "reneging" on their promise to devolve more power to Scotland. In the interview recorded for the Sunday Politics, Mr Salmond said the pledge made by David Cameron, Ed Miliband and Nick Clegg had been "cooked up in desperation".